The InTANK iR2770 by Raidon Technology, Inc. has a patented design that allows two 2.5" SATA HDD/SSD to be fitted into one 3.5" drive space. It's equipped with optional RAID-0 to enhance the speed of transfer compare to a regular HDD or switch to RAID-1 for secure backup. The internal RAID module supports 6Gb SATA host interface and SATA 22 pin power supply; the connector location is exactly the same with a 3.5"HDD. Thus it is not necessary to install any other brackets but just install the iR2770 to existing OS and then the system will be upgraded as a RAID to secure data. 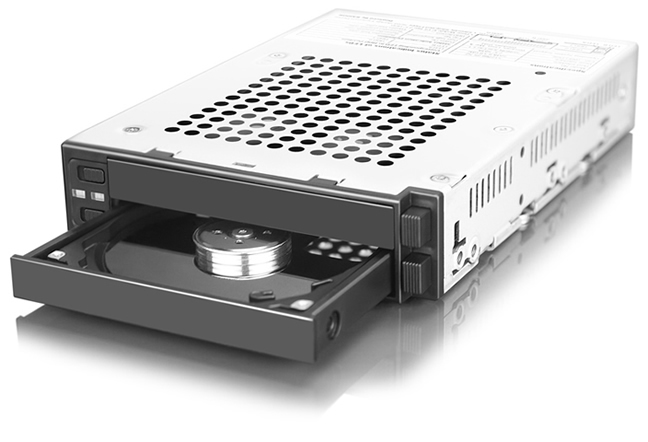 The design of SATA connection gives itself removable characteristics; through the removable trays, removing and installing SATA HDDs is more secure. Users can move the entire HDD like moving an entire video library. Users no longer need to rummage through a stack of CDs/DVDs to look for a video. Let the removable tray design make your workflow faster and more convenient. The company has already envisioned these application advantages for users. This makes the system faster and digital photos more secure, it can be used as a workstation for photographers. Using the 2.5" HDD slot to install SSD, the performance of the system can be faster, whether running PhotoShop or Lightroom, to edit photos or to search thumbnails. Moreover by using the storage space constructed by the 3.5" RAID-1, it is suitable for gamers to save large amounts of original RAW files as well as following-up completed files after editing. The advantage of automation equipment is in its production efficiency. In high-speed production processes, the worse happened in case of system failure, it will cause a shutdown of an automated production line, the production loss during these shutdowns is far greater than business owners can imagine. By using the RAID-1 module, you can protect automation systems in long-term operation and do not have to worry about halts in automated production equipment due to HDD damage. From small-scale CNC processing to large-scale semiconductor manufacturing processes, the RAID-1 module is recommended to protect the long-term operation of systems and achieve high production efficiency.